People are always telling me that today’s music isn’t as good as that from the 1960s. I reply that just as many great records are being made now; what’s different is that, in the 60s, the terrific ones were also the popular ones whereas today, much of the best stuff is relatively obscure. 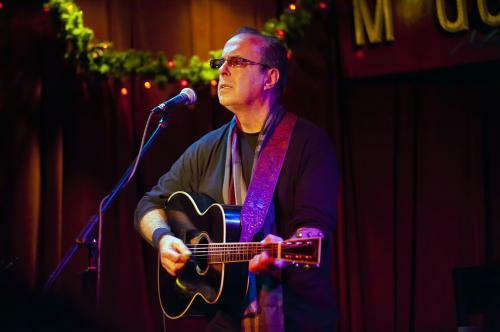 A perfect case in point: Tom Russell, who has issued more than two dozen rather uniformly fantastic albums over the past three decades. Unfortunately, this material doesn’t stand a chance against the likes of Justin Bieber but that doesn’t mean it isn’t wonderful. The new Aztec Jazz may be the most wonderful to date. 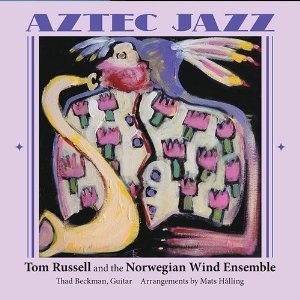 Tom Russell has never been afraid to try something new and different, but he really outdoes himself on this album, a live 2012 performance with guitarist Thad Beckman and the 31-member Norwegian Wind Ensemble. What to call the result, which incorporates elements of jazz, folk, Tex-Mex and classical music? Who knows? Who cares? As Russell writes, “The results were beyond our dreams. Sometimes it sounded like Western movie music and sometimes it called up Miles Davis’s Sketches of Spain. [The Wind Ensemble] played behind us without overpowering the songs, and I think my singing is far better than my vocals on the original tracks.” Perhaps so—though his always-emotive vocals on the originals were pretty damn powerful. At any rate, the Ensemble’s trumpets, oboes, saxes, French horns, trombones and percussion—inventively arranged by Swedish composer Mats Halling—put a new slant on this classic American roots music. As for the 11-track program, all written by Russell, it makes a strong case for him as one of the great songwriters of our time. He covers a lot of turf, but always sticks to subjects that relate to his personal experience and passions. Highlights include “Finding You,” a poignant love song; “Goodnight Juarez,” about the poverty in that city; and “East of Woodstock, West of Vietnam,” about spending the late 60s in Africa. Then there’s the apparently autobiographical “Criminology,” in which he sings, “You may think I’m just a folk singer / No, I’m a master in the art of criminology”—which may sound nonsensical until you check Wikipedia and learn that, sure enough, Russell has a master’s in the subject from the University of California at Santa Barbara. The guy is full of surprises, musical and otherwise. Somebody should nominate Aztec Jazz for a 2013 Grammy. And it should win. But first the nominator will have to figure out what category it belongs in.